P Ballings BT Wursten Along dry river near bridge crossing Entrance road to Nkasa Lupale N.P. Floral bracts and sepals ovate; leaves densely pubescent, cordate. It grows together with a number of other known invaders: Black wattle (Acacia mearnsii), Ginger lily (Hedychium gardnerianum), Homalanthus populifolius, Pinus patula, Passiflora sp. and Cape gooseberry (Physalis peruviana). Hyde, M.A., Wursten, B.T., Ballings, P. & Coates Palgrave, M. (2019). 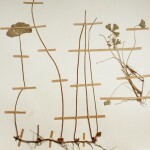 Flora of Botswana: Images made by Petra Ballings.